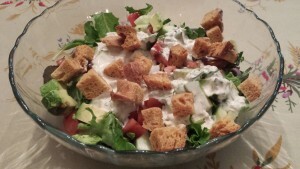 Low Fat Blue Cheese Dressing — Can It Really Be? Ever since I was a little girl, I have loved blue cheese dressing — so much that I created my own Low Fat Blue Cheese Dressing. Whenever my parents and I visited my maternal grandparents in Pennsylvania, Grandpap would usually want to take us out for Sunday dinner to a restaurant that had a big salad bar. That salad bar had a super thick and creamy blue cheese dressing with huge chunks of Roquefort cheese, bits of garlic, and just the right amount of cracked black pepper. I loved that dressing mostly because that’s what my grandfather loved — like grandfather, like granddaughter! 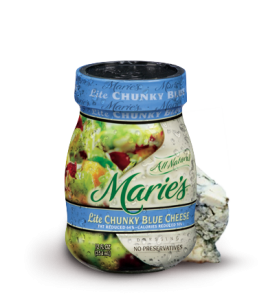 Most of us probably grew up with the “fancy” Marie’s blue cheese salad dressing that was sold in a jar in the refrigerated case at the supermarket. Also available widely were the bottled Wishbone and Kraft Roka blue cheese dressings. I found them all to taste over-processed and longed to see Grandpap and hoped he would take us out for real blue cheese dressing! Since Grandpap’s favorite restaurant closed years ago, I set out on a trek to find another restaurant-style blue cheese dressing. As far as restaurant versions go, I found two favorite blue cheese dressings — one at The Chart House (here’s their recipe) and another at Bruno’s Italian restaurant in Indiana, PA. 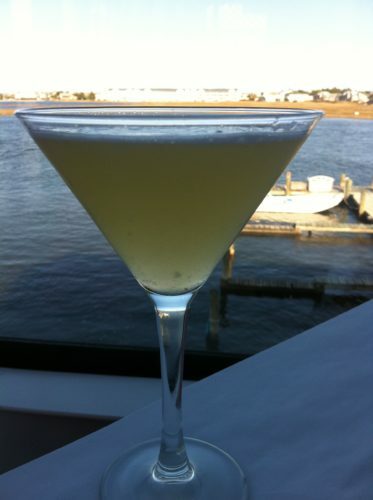 The Chart House locations are mostly known for their close proximity to water and for great views from every window. Bruno’s is an Indiana, PA landmark which I haven’t patronized for about 10 years. Bruno’s “house” dressing was a strange bright orangey-red color, full of blue cheese chunks and very sweet, and I never did figure out what was really in it. You either loved it, or you hated it. But I loved it. Another restaurant version that I liked a lot was a vinaigrette-based “clear” dressing with lots of gorgonzola cheese crumbles from the now-defunct Pasta Piatto in the Shadyside district of Pittsburgh, PA. And I love the blue cheese wedge salad at NorthEast Seafood Kitchen in Ocean View, Delaware. Eventually, I came up with a version of my own blue cheese dressing. This is a low fat version using fat free yogurt and sour cream, and low fat buttermilk. It’s chock-full of blue cheese crumbles, but you can cut back on the amount of blue cheese if you are concerned about your fat intake. Another option is to use some feta cheese crumbles along with the blue cheese. 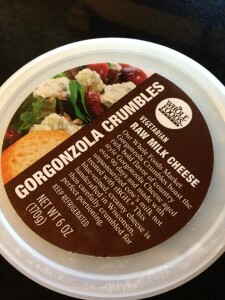 I like to use Whole Foods Market‘s Gorgonzola Crumbles for my dressing. And lots of cracked pepper adds some spice! 1. Whisk together the yogurt, sour cream, buttermilk, Worchestershire sauce, lemon juice, and garlic in a non-metallic bowl. 2. Fold in the blue cheese crumbles, Vidalia onion, scallions, and parsley. 3. Season with salt and pepper to taste. Thin with low fat milk if you prefer a thinner dressing. 4. Refrigerate for 4 hours or overnight in a non-metallic container. This dressing gets better the longer you let it sit. Makes about 2 cups of dressing. Keep tightly covered in a non-metallic container in the refrigerator for up to a week (if it lasts that long). Serve over sliced tomatoes along with some minced red onion. This dressing holds up well when tossed with romaine lettuce leaves. You can also use this dressing as a vegetable dip. Serve with carrot, celery, bell pepper, and zucchini sticks for a simple appetizer or party-worthy dish. A favorite salad of mine is the blue cheese wedge which includes cherry tomatoes and pickled red onions with some crispy bacon bits — obviously higher in fat due to the bacon. Variations: Mix in some mayo if you want a thicker dressing. 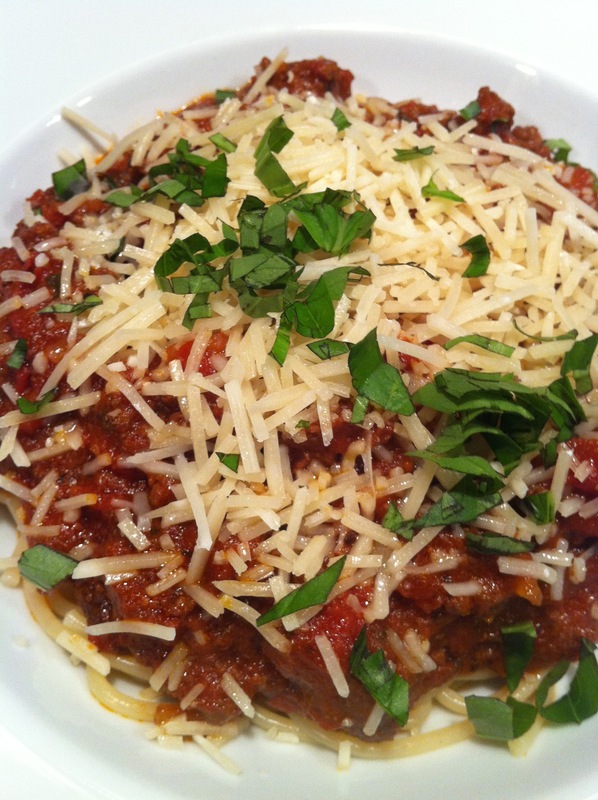 You can add some diced sundried tomato for an interesting flavor. If you are not a fan of raw onion, you can eliminate the Vidalia onion and scallions and replace with more parsley. It’s hard to make this recipe completely “fat-free” due to the bleu cheese content. Eat this dressing in moderation.